75th and Sedgwick: Impressive Wines for $20: Part One! 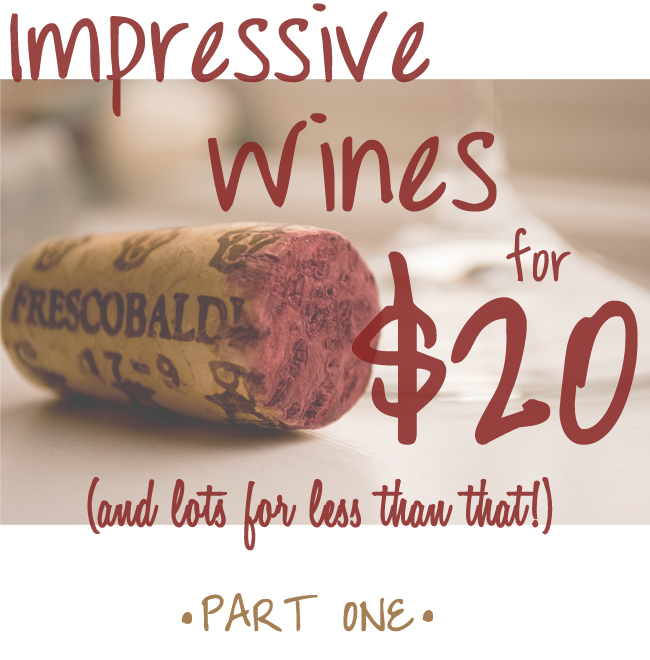 Impressive Wines for $20: Part One! So earlier this year I had the idea to ask two wine aficionados in my life for their favorite wines under or around $20. I asked them for this because I have a terrible memory when it comes to wines that I like! It seems like whenever Nick and I are headed to a dinner party we have 5 minutes in a wine store to pick out a good wine to bring to the party, and of course my mind goes BLANK and I can't remember a single good wine! So enter this blog post: I figured if I was going to get the advice I needed in list form, I just HAD to share it with you! I've saved this post until now since everyone is attending and hosting lots of parties this time of year. Also, I always think wine makes a great gift! Part one comes from Jon, a wonderful friend from college who was even a groomsmen in our wedding! Jon grew up in California, so yeah, he knows his stuff. Jon loves wine and knows a lot about it. I am always telling him he should become a sommelier. Decoy (CA) - This is a type of wine that Duckhorn makes. It's their lower-end brand and all of their wine, including their whites, are very, very good. They are all about 20-24 bucks. I specifically like their "Red" which is a blend. They make a cab, zin, and merlot too. D'Arenberg - Love this Australian label. Anything they make is fantastic. Two of my favorites you can get almost anywhere are the "D'Arry's Original" (which is a shiriz/granache blend) and the "Footbolt Shiraz". Both fantastic wines and both around 15 bucks. Also, they make wines at around 9-11 bucks called the Stump Jump wines (white top, white label). There are two reds - the "Stump Jump Red" and the "Stump Jump Shiraz" which are great wines for 10 bucks. Ridge (CA) - Anything they make is very nice. Lot of blends, lot of zinfandel used. Some of their wines get up into the $30 range but they are well worth it. I personally love the Geyserville which is about 28 bucks. A good, cheap, Italian type of wine to look for is Nero d'Avala. This is a type of grape and its big, fruity, will taste great with food, and its cheap (10-20 bucks). Simi (CA) Chardonnays are great and all between 10 and 20 bucks. Mazzocco winery. They make a ton of single vintage zinfandel's and they are AMAZING. They make some cabs as well which are very good. I am a wine member here and get a few shipments a year from them. Seriously, fantastic. Price point is from under 20 bucks all the way to 40 pretty much. VERY good though. Worth checking out! Anyway, those are what I am liking right now. I don't like Merlot and I don't like Pinot Noir so if you want anything from either you need to go someplace else!!! Thank you so much, Jon! Also, anyone up for a trip to Sonoma? Later this month: my dad's picks! PS: The wonderful photo of the cork is from the talented derekGavey on Flickr! This is a constant source of stress for me, I'm always standing in the aisle looking dumbfounded. Not anymore! I'm putting this list in my phone right now, goodbye aisle angst! thanks! What a good article -- thanks for sharing! I do remember when I was studying abroad in Rome that a glass of house wine was cheaper than a Coke! Also, my family plays a similar game: we all get to try three different priced wines and try to guess which is the $10/bottle, $20/bottle and the $30/bottle. I'm NEVER right, but its fun! Such a great idea! I've been buying the same bottle of wine for over a year now (Alamos malbec - delish!) for every event and seriously need to branch out. Lucy! I cracked up when I saw this -- I too have been drinking Alamos malbec for at least a year straight! And bringing it to parties, etc. It is a great one that we should keep in rotation! Ha, so funny! I was at a dinner party one night and four of us showed up with it, and they all said they didn't think I would actually show up to another dinner with the same bottle!